Modest in size but grandly designed, this five-piece round pub table and counter stool set offers a classy look and feel for your home. 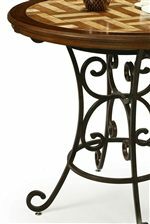 Featuring an impressively beautiful scrolled metal base, a sense of shape and movement radiates with the unique pedestal design and gently curved iron metalwork of the table. A 48-inch glass table top with a one inch bevel complements the metalwork perfectly, giving this table a refreshing, posh presence for your dining area. Accompanied are four elegantly refined counter stools with curved arms. Intricate scrolled metalwork on seat backs add visual appeal, while upholstered Florentine Coffee seat cushions ensure long lasting comfort and soothing tones. A swivel base and lower footrest present even more comfortable conveniences to enjoy. Finished in a warm Autumn Rust, a chrome plated finish on all pieces fights against rusting for durability and longevity. Truly, this round pub table set emanates a distinguished elegance to dress your home and dine in refinement. The Magnolia 5 Piece Round Glass Top Table & 26" Counter Stool with Arms Set by Pastel Minson at AHFA in the area. Product availability may vary. Contact us for the most current availability on this product. MA-4819-Tabletop Round 1" Bevel Glass Tabletop 1 48" 48"
MA-520-Base 36" Dining Table Base 1 24" 33" 39.5"
MA-217-AR-649 26" Counter Stool with Arms 4 20" 22" 42.5"
Table Info Includes one 48" round table with a 1" beveled glass top. Arm Chair Info 26" upholstered barstools with arms. Swivel base. Finish Manufacturer utilizes a 5-stage powder coat system, which offers better protection for a more durable finish. Finish & Paint Options Features an Autumn Rust metal finish. 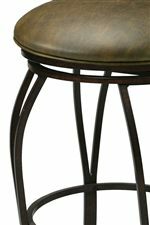 Case Detail Features scrolled pedestal metal bases. Description: Top Glass tops are made of 1/2" glass with 1 1/4" thick bevels. Wood tops feature solid hardwood construction and catalyzed finishes for durability, good looks, and protection against staining. Available table tops include Wood Veneer, Wood with Travertine Insert, Hammered Metal Top, Poly Travertine Top, and Glass Top. Case Construction Heavy duty 16-guage steel construction for durability. Wine and dine in refinement with the Magnolia collection. Featuring an assortment of pub tables and stools, you can fashion just the dining space you have always desired. With a variety of table top choices, including wood, travertine, hammered metal, and glass, you can create a casual or more formal dining area for your home. 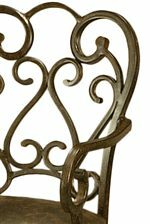 Elegant swivel counter stools with decorative metal scrollwork offer comfortable seating with a posh styling to enrich and uplift your décor. Refreshingly innovative and filled with a variety of designs of choices, find just what you were looking for with the Magnolia Dining collection. The Magnolia collection is a great option if you are looking for Traditional furniture in the area. Browse other items in the Magnolia collection from AHFA in the area.